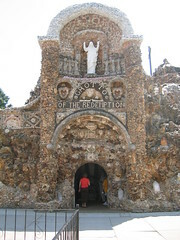 The World's Largest Grotto of the Redemption in West Bend, Iowa was a free stop on our way, and a superlative at that. We followed the directions carefully and came upon a pretty average looking city park. . . but at the far end, past the swingset and the duck pond towered a structure of semi-precious stones, shells, and other bits and pieces. We wandered aimlessly through caves and passageways crusted in stone. In each nook and cranny were white statues depicting Bible stories. Soothing hymns floated through the air. Birds fluttered about. Fountains delicately sprayed soft mist. Instead of waiting for a guided tour, we decided to check things out ourselves: The Grotto itself, the adjacent museum, and the super-gaudy gift shop with glow-in-the-dark roseries and plastic crosses. Construction of the Grotto began in 1912 the work of Fr. Paul Dobberstein. He worked on the construction for 42 years until his death when it was picked up by Fr. Louis Greving. The Grotto with its bejeweled exterior seems a little excessive for depicting the life of Christ, but I guess there are plenty of ornate churches out there, so why not. We were amazed that something like that could just sit out in the open without obvious vandalism or theft. . . maybe those statues had a few hidden cameras behind their eyes. We'd definitely recommend a stop by if you're interested in religious art or just like the twinkle of jewels. The adjoining park is also lovely for a picnic.